New piece presently under way. Detail: applique over my grandparents' letters. This post finds me deeply, happily immersed in very personal, very storybook-like stitching for a new art quilt; however, earlier this week, I posted this photo on Instagram and it received lovely feedback (thank you all! ), as well as a few requests to explain how I printed my grandparents' letters onto fabric. So, below is a quick tutorial for your creative pursuits! Enjoy, and please share how you decide to use this technique: #tierneybarden. We'd all love to see! STEP 1: Cut an 8.5" x 11" piece of freezer paper and with a dry hot iron, press it well, shiny side down, to the back of a piece of fabric cut to the same size. STEP 2: Place your image that will be printed onto the fabric on your scanner bed and close the lid. Carefully load your fused fabric sheet* into your INK JET printer and print. (I've always read this technique only works with ink jet printers. I haven't tried it with other types.) *It's helpful to know which way to load your fabric sheet in order to print on the correct side. This is how my fabric looked coming out of the printer. This delicious powerhouse seed mixture is now a staple at our house! In a large bowl, combine 1 cup old-fashioned oats, 3/4 cup raw pumpkin seeds, 2/3 cup sunflower seeds, 3 Tbsp. chia seeds, 3 Tbsp poppy seeds and 1 tsp. kosher salt with 4 tsp. vegetable oil, 1 Tbsp. pure maple syrup, and 3/4 cup room-temp. water and mix well. Let sit and thicken for 10 minutes. Spread mixture evenly onto the prepared pan, pressing with your hands to an even layer about 1/4" thick. Bake for 15 minutes. Gently stir the mixture and bake for another 15-20 minutes, until light brown and smelling toasty. Let cool in pan, then transfer the mixture to a glass jar or other air tight container. * Feel free to substitute chopped nuts of your choosing; chopped sturdy herbs like rosemary or thyme; chopped dried fruits like raisins, apricots or cherries. Flowering Snowball blocks on the design wall. I'm not ready to let go of winter. The world around me seems anxious for spring to arrive, yet I'm still safely embedded in winter's embrace, filling my days with stitching and dreaming and planning. And drinking fennel tea. I actually feel most productive during winter months, spending long hours in the studio, many of which are well before sunrise. There's something powerful, even magical, about those early morning hours, offering a space that is completely my own, shrouded in darkness and free from visual and audible white noise. I can truly immerse myself in my imagination and stay there, suspended, for hours. Winter affects my palette and subject matter in marvelous ways. For me, all of this is worth holding on to for a little while longer. This article recently caught my eye and I thought I'd share it with you. In this day of throw-away textiles, it's somehow personally fortifying to become more acquainted with a garment that was made with care and made to last. 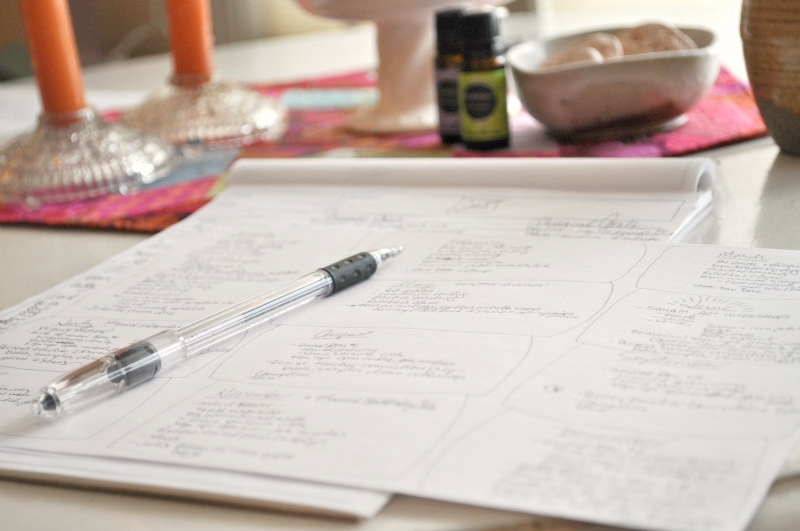 In this post I shared my personal method for setting and planning goals. I've just checked in on my own goal calendar and I'm happy to report that I'm on track! How about you? I'm currently deeply immersed in creating a body of work for a very special show this summer. Details to come. 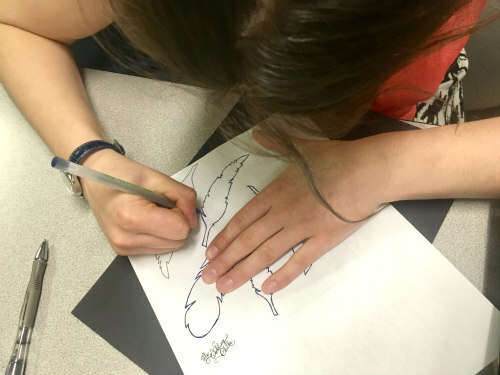 March: I'll have the honor again of participating in a long distance expedition with a phenomenal teacher, Mrs. Rebekka Boysen-Taylor, and her class at the Palouse-Prairie Charter School in Idaho. 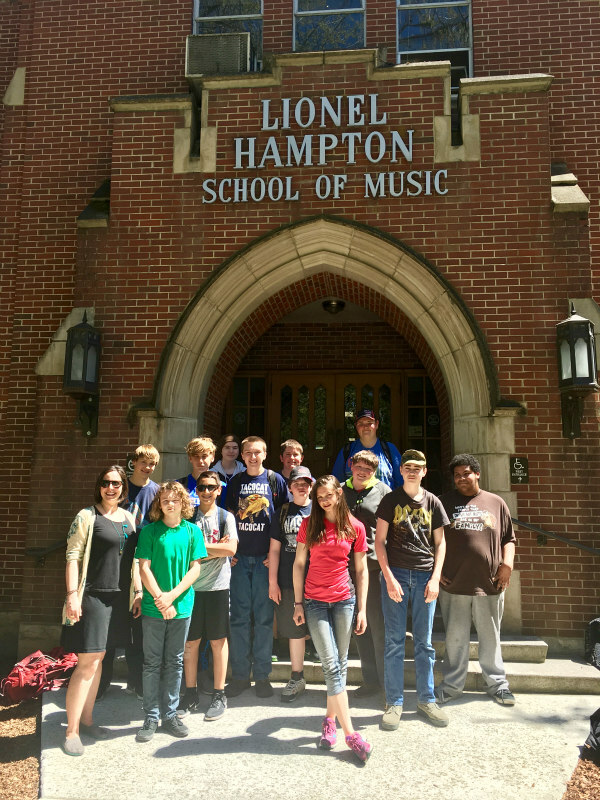 This will be my second year, and I'm excited to engage with another talented, committed group of students! You can see what last year's class created here. June: I'll be teaching at Squam Art Workshops. SAW has a few openings if you're interested in joining the fun! Late Summer: An exciting project by a fellow textile artist will be announced, and I'm thrilled to be a part of it, in my own small way. Stay tuned! July-December: My first ever Block-Of-the-Month program! It will featuring all of my favorite techniques: EPP, applique and piecing! Details for this 6 month program will be announced in May, with the program running from July to December. For a quick, charm-friendly and classic baby quilt, download my FREE Gingham For Giants quilt instructions in the right margin! Scrap bust with my FREE Striped Octagon template and instructions! 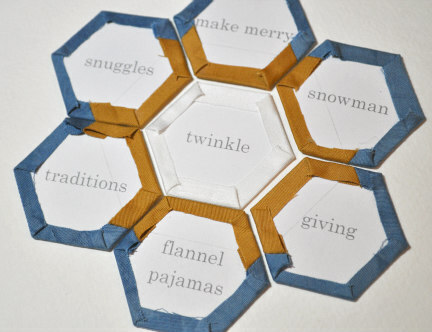 Try either of my FREE themed hexi PDFs for an extra special hand stitching experience! For many of us, the new year means a chance to wipe the slate clean and start fresh, dream big. One of my absolute favorite things to do this time of year is assess both my business and my personal goals. I admit it doesn't sound very romantic, but it does go a long way to being prepared, and therefore, feeling empowered throughout the entire year. Simply stated: fail to plan, plan to fail. Inspiring clay words are lightly sprinkled with soothing lavender and refreshing peppermint essential oils. Probably the single most important step: schedule and commit to a time to settle in and do the work. I treat it as a ritual of sorts by setting a peaceful, calm mood and clearing away distractions. Being alone with no TV or music is a great start. I light candles, wear soft, comfy clothes, brew a fresh cup of coffee, put my phone on silence and finally, get a fresh tablet of paper and a smooth flowing pen. For this exercise, I still prefer to write by hand because it forces me to slow down and to be mindful, but using your tablet might suit you best. Using what works for you is important. First, on a blank piece of paper list all of the goals and wishes that come to mind for the new year. I don't edit at this stage - I simply list everything, no matter how outrageous! I take my time with this step, after all, it's defining how I'll spend my year. To really embed these new priorities in my mind, and to make the next step more efficient, I write my A, B, C goals as three separate lists. My A list is always short, and becomes the backbone of my year. Here's the last step: The Master Calendar. I have a separate paper with 12 roomy, blank boxes, each labeled with a month. If you want something more spruced up, plenty of free calendar templates are available online. Items from the A list are written in each appropriate month's block. For example, you might need to work on an event for six months leading up to the event, so break down the steps into manageable chunks and assign each to an appropriate month. Next, items from the B list are dropped in throughout the year according to when they make sense to be worked on. Repeat for the C list. Something important to note: if any item on a list doesn't excite me or isn't important to the growth of my business, it simply doesn't go on the calendar. And that's OK. This exercise is about getting clear on your own priorities and realistically mapping out time to accomplish your goals. By now, I can really see how my entire year is shaping up. I stop here, for a while, and ask if this line up truly seems achievable, or am I better served letting some thing(s) go. The older I get, the more I appreciate quality over quantity. I also remind myself that things usually take longer than expected. At this point, I'm looking at my whole year on one page where I can regularly check in throughout the year and keep myself on track. I can also modify the calendar as the year unfolds and be reminded of small things that, despite best intentions, might have otherwise fallen through the cracks. This approach to goal setting and planning can be used in all sorts of manners: maybe you're building your handmade capsule wardrobe, or want to take your blogging to new heights. This is the place to commit to family outings, campfires and stargazing. Assign blocks of time devoted to making the quilts you really want to make. Schedule your workouts. Make dates to get out and have fun. One thing we can all count on is that the year will pass, so let's be sure to make the most of each month, each week, each day. A one-page calendar isn't meant to capture project details, inspiring photos or important contacts, so those parts of the process are best left to a second wave of planning: inspiration boards, journals, sketchbooks and planners. Personally, the list maker in me depends on a Franklin Planner for infusing the big goals with the details of daily life. For drawing, I'm transitioning from purely using handmade sketchbooks to increasingly using my ipad and apple pencil. With these additional methods to plan and track progress, what's the point of the goal planning calendar? By keeping my entire year in front of me, I always see the big picture, as well as the sum of its parts. And to make sure I don't lose sight of where I'm going, it hangs from a clipboard just inside my studio door. This exercise is meant to set myself up for an awesome year, one that I can look back on and feel satisfied, which is why I only include goals that are meaningful, purposeful and positive. I hope this guide is helpful as you plan your beautiful year ahead. Feel free to drop me a line with any questions. Metamorphosis, 2014, 41 3/4" x 35"
On Winter Solstice, I posted my art quilt, Metamorphosis. Metamorphosis tells a story about dreaming the dream. I made this quilt during a time of radical change in my life. Deciding to start a new chapter came with all kinds of emotions, and allowing myself that safe space to imagine the possibilities was paramount. This quilt celebrates my journey. Crown Vetch grows vigorously near our house, and during the summer months I see it on my walk to the mailbox. Common. Unassuming. Humble. And at night, bowing its head to a dream much larger than itself. Moth eye spots ward off predators, protecting the sacred space held for dreaming. A necessity for survival. Making Metamorphosis was truly enjoyable. I'd spend 12-14 hour days steadily stitching my story. My first step was to make a cartoon, a full scale ink drawing. With a road map in place, the fabrics and construction methods were decided as the quilt progressed. 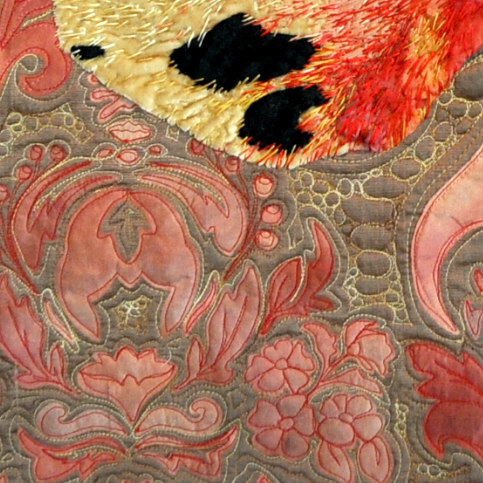 Some areas, like the darkest petals of the damask flower were best done as reverse applique (they're found toward the center of the quilt, see detail). This allowed them to sink into the background in order to give the entire damask flower the appearance of coming into being from the deepest depths of a dream. The rest of the damask pattern is appliqued using the freezer paper method. The Crown Vetch, however, was best executed using fused applique. Doing so allowed exact placement of each hand cut leaf and flower petal, often with the aid of tweezers, before being fused into place. The moth eye spots were a surprise, as I didn't have a plan how to make them. I decided to cut fairly large, wonky circles from a gold piece of my hand dyed silk, followed by a smaller circle of black cotton, and then an even smaller circle of pink cotton. I stacked up the circles and with free-motion stitching, I covered each stack with as much thread as my machine would allow before getting tangled up. The dense stitching caused each eye spot to bubble outward, raising them off the surface of the quilt and giving some dimension, which I really like. The entire quilt is sparingly free-motion quilted. Within a few months of completing Metamorphosis a second art quilt came about. I've decided I'll share Self Portrait in the spring at about the same time it was completed back in 2015. (Sneak peek on the left.) While each quilt's story stands on its own, the two quilts together tell an even larger story. Looking ahead to the new year, one of my intentions is to develop and strengthen my storytelling voice. I'll share the journey, and hope you'll share your feedback with me. We all share a love of textiles, and I value what you have to say. You can always email me or DM on IG @tierneybarden. Going in to the New Year, I've increasingly felt the need to share my art quilts, as well as to allow more time for making art in the form of quilts and paintings. Many of you who follow me on social media are familiar with my naturally dyed fabrics and traditional quilt patterns. So, while business continues as usual, I'm also spending some time creating a body of work in the form of art quilts and paintings. Sharing this body of work with you is the end goal. Stay tuned for information about where to see this blossoming collection. Cream butter and sugar. Beat well after each addition: eggs, extract, flour + baking powder, coconut milk. Pour into prepared pan and bake immediately for 60-75 minutes until cake is firm, golden and pick test comes clean. Cool in pan for 10 minutes. Invert onto plate and leave pan in place over cake until cool. Make frosting by beating all ingredients until smooth and fluffy. Frost cake as desired and dust with shredded coconut. Cut yourself a slice, get cozy and savor each bite! Teaching In 2018, Plus an Irresistible Gingerbread Cookie Recipe! Scissors and Mother Nature coming together for a day of enchantment! Join me for a day in the woods as we take our paper cutting to new heights, inspired by the beauty that awaits right outside our cabin door. Our day together will inspire paper enthusiasts, art journalers, printmakers, quilters, painters, book makers...anyone who enjoys nature and pattern. We'll work first with papers and then with fabrics. (Stitching later on your own is completely optional.) I'll bring plenty of materials, but if you wish to bring a few treasured bits and pieces of paper or fabric, please do! You can read the materials list here for more information. Now that the holidays are in full swing, I confess that as an empty nester some beloved Christmas traditions have sadly fallen by the way-side. So when my very dear friend Jodi, a Super Mom who puts the "festive" in "holidays", invited me for a weekend of holiday baking, I didn't pause for a moment before saying, "Yes!!" Jodi's skilled hands at work! ABC Gingerbread Men and not-so-Ugly Sweaters share a plate with more traditional cookies. Busy hands! Jodi's nine year old son, Keegan. On our day of baking, flour was flying, cookie cutters were clanking and laughter was bubbling. While snowflakes fell, we sang to all of our favorite Christmas songs and Jodi's entire home smelled scrumptious. Here's to holiday baking, treasured memories, and doing it all over again next year! If the people you love need a pleasantly spicy, heart warming cookie, here's the irresistible gingerbread cookie recipe we used. Before I sign off for the Christmas holiday, this is a good time to remind you of my FREE (QUICK!) quilt pattern in the right hand margin, and FREE Winter Wonderland Hexi EPP template (which fits nicely in a stocking, or conveniently rolled and tucked into the tree or other clever hiding spot)! 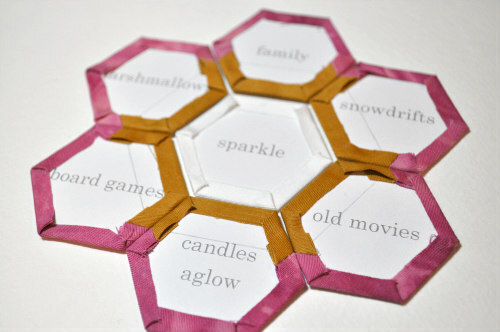 See this post for a project and tutorial using these inspiring hexis. 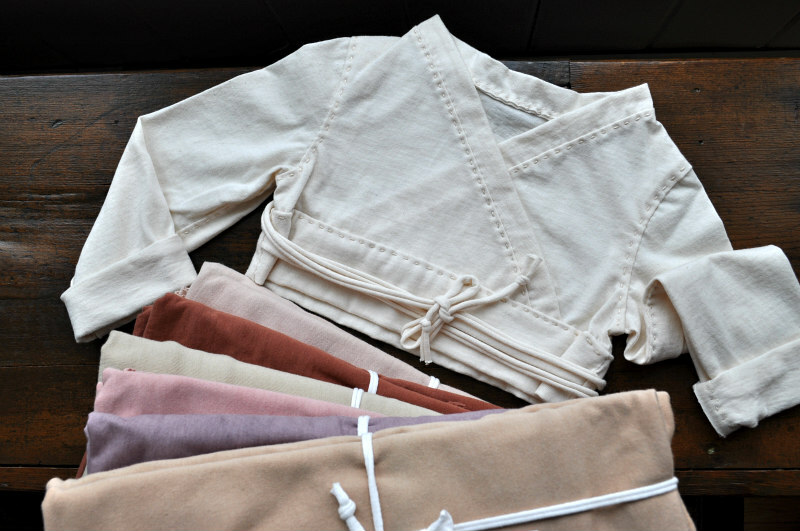 Gorgeous naturally dyed organic cotton sateen fabrics are in the shop. My Harvest quilt pattern would be a stunning heirloom in red and white! Have a look. As an extra special touch for any gifts, I'll wrap (in brown paper and string with a sprig of greenery) and ship directly to the recipient at no extra charge. Simply email me the details. These new bags are sold out, but more are under construction. Stay tuned after the holidays. Thank you for following along during this year of steady growth and wonderful surprises. You are the reason I do what I love, and having your support matters. I'll be back with a New Year's post sharing some exciting things already lined up for 2018...hint, hint, my very first BOM! In the mean time, I'm wishing you a magical, fun-filled holiday season wrapped with love. Introducing Harvest, my newest quilt pattern! Many of us are giddy for this season of comfort foods, flannel PJ’s and board games by the fire. In that same spirit, we gleefully cover our cutting tables with cozy projects to sew during the long cold months ahead. I'm no exception, so it's probably not surprising that I designed this two-color quilt using my favorite naturally dyed color, Tobacco. It feels perfect for this time of year. My Harvest quilt hangs on our Family Room wall and really warms up the heart of our home. I can just as easily imagine this quilt keeping a much-adored child warm. A Twin Star block is framed by alternating rows of quarter square triangles, effortlessly coming together as a modern medallion quilt. This timeless design would look smart in red, navy, or any other strong contrasting color. A quick and easy project, it's an excellent skill builder for the advanced beginner. I’ve used straight line quilting, but this design lends itself to endless quilting options. The finished quilt measures 44.5” x 44.5". To qualify, head on over to @tierneybarden and follow the simple steps for your chance to win your very own PRINTED copy of Harvest! I have 5 print copies to give away, plus I'm tucking in a gorgeous pack of my naturally dyed fabric, one of my handmade needle keeps, and a few more goodies that I've made just for you! WAIT! I want everyone to be a winner, so now through this Sunday 12th, Harvest PDF is 20% off! This just might become your go-to pattern for baby, wedding, holiday and house-warming gifts! Imagine the possibilities by simply changing the colors! GOOD LUCK, EVERYONE!! WINNERS WILL BE ANNOUNCED MONDAY 13th ON INSTAGRAM! This time of year finds me gathering up all the yarn, all the baking pans and all the sewing patterns! September awakens a renewed excitement to make. By October, I'm so far in that holiday gift making has taken over the work table, knitting projects dot couches and chairs, and delicious scents waft through the house - and I send out my silent wish: please let this be the year someone figures out how to squeeze in a few more hours into the day. 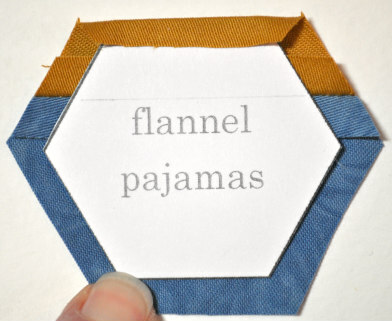 From the posts I've seen on Instagram, I'm not alone with this seasonal urge to get cozy and make. In that spirit, I'm sharing a few recipes and a project to help us get our Fall on! These chocolate chocolate chip cookies are scrumptious! I add 3 Tbsp. of brewed coffee to the wet ingredients. I also freeze at least half the recipe as pre-shaped balls so we can enjoy them on demand. Everything else is "on demand" these days, so why not cookies? Those fingerless mitts you see are a FREE pattern by Tin Cat Knits called "Maize". Easy. Fast. Cute! A well-written pattern suitable for beginners. Finally, I'm sharing a lip balm recipe that I recently made and thought you might like, too. The recipe is a knock off of a well known store-bought product. A long time user of the store-bought product, I honestly prefer this homemade version because it's softer on my lips (not as waxy) and I can control the essential oil(s) used. The homemade lip balm lasts a very long time, and you'll have plenty to give as gifts. If you'd like to make your own, you'll find the recipe here, courtesy of Wellness Mama. I doubled the recipe and filled twenty five 5 oz. jars, shown at left. I purchased the lidded jars on Amazon, the essential oils from stillpoint.com, (I used peppermint), and the other ingredients from bulkapothecary.com and amazon. Before I sign off, I have to share a special fall ritual of mine: attending the Little York Fall Fiber Festival in Preble, NY. If you're in the area next weekend, October 14-15, you must stop by! The intimate, historic Little York Pavilion is where you'll find several excellent quality makers and products. In years past, I've come home with sheep skins, unusual and beautiful spinning fibers, exquisite yarns from local sheep and alpaca farms, and beautifully crafted (and now coveted) tools of the trade. The festival offers far more than that - come and see for yourself, and bring friends! The Release of "Girl Power" & Giveaway! 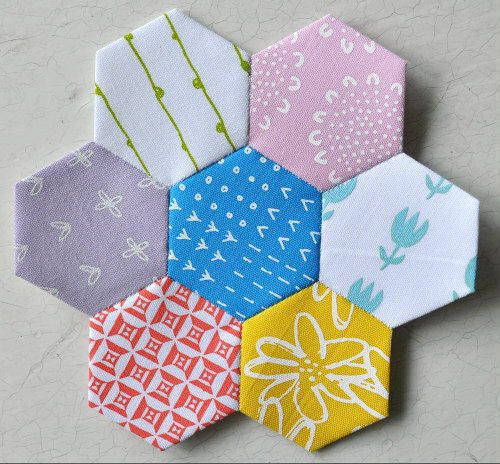 FREE "Girl Power" Hexi Papers for EPP! Cheerful Grandmother's Flower dressed in Karen Lewis Textiles fabrics - totally appropriate for celebrating "Girl Power'! EPPers and hand stitchers tend to be a mindful lot, and what better way to keep inspiring words and ideas close than to stitch them into our EPP projects? "Girl Power" is one page of 28 uplifting, empowering words perfect for any one who enjoys English Paper Piecing. Imagine giving these to a young person just learning to stitch. PRINTING: When printing your page of "Girl Power" Hexis, use your desktop computer and 8.5" x 11"/Letter Size/A4 paper, and set your printer to SCALE 100%. Print one page and test by measuring one side of one hexagon. It should measure 1" from point to point. You can also give the PDF to your local copy shop. PAPER TYPES: EPPers use a variety of papers, so print on the paper you prefer. Many of us use copier paper or a lightweight card stock. IDEAS FOR USE: A few pages of "Girl Power" Hexis would make an excellent gift for an EPPer friend, whether the pages are left whole, or if you've cut them for your friend's immediate use. Gift the hexis with some amazing fabrics. Do you know a young stitcher who'd find these hexis pretty cool? How about using them in an art journal or mail art? A simple, sweet EPP project sure to brighten a friend's day. 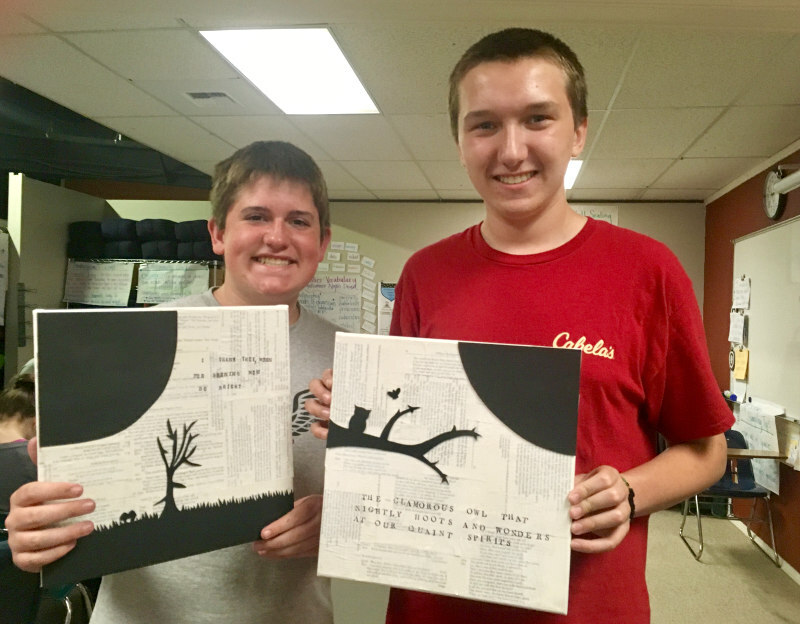 Start your inspired EPP project today! 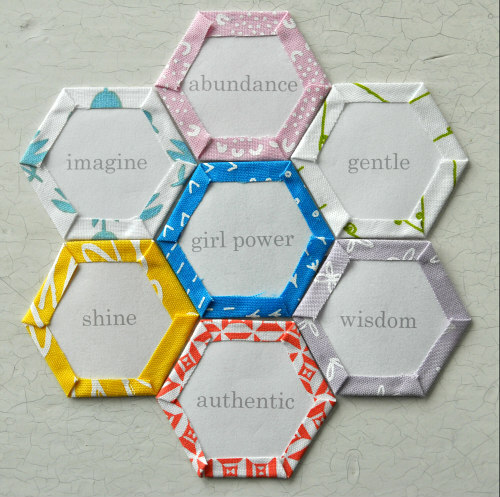 For those who aren't interested in printing and don't mind cutting their own papers, I've made "Girl Power" Hexagons available in my shop, already printed on white cardstock. What you'll receive: the listing is for one page of 28 - 1" hexis, each sporting a fun-loving or spunky word to enliven your stitching experience! But wait, there's more: Win a set of four "Girl Power" pages (112 hexis) printed on cardstock for you and four more for a friend! Just follow me on Instagram, tag a stitchy friend and you're both entered! I'll announce the winner on Instagram Monday, August 7th. Good luck, and happy stitching! Independence Day Sale and the VT Quilt Festival! We're back from the Vermont Quilt Festival, and what a fantastic time we had! I had the pleasure of watching my dear friend Jodi enjoy her first quilt show (and we shopped our hearts out! ), as well as give my friend, Trista Dufresne, a great big hug! I waited a whole year for that hug. This is my favorite show because it's so well run, has a spectacular quilt show and a wide variety of quality vendors - it was definitely a good choice for Jodi's maiden voyage! 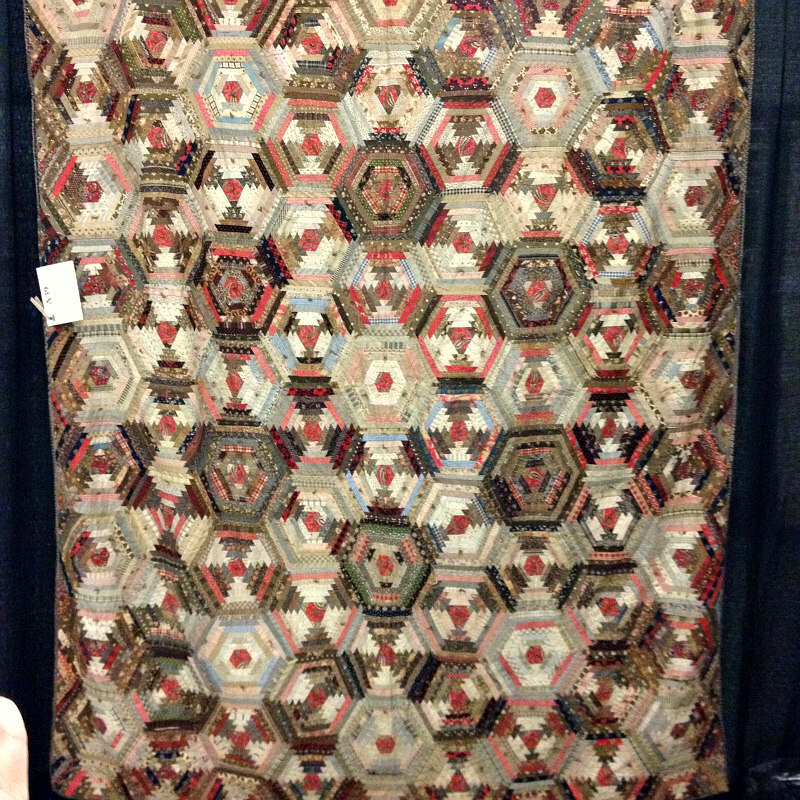 Upon my return from the VT Quilt Festival last June, I shared some of the antique quilts that were on display, and they were very well received. This time, I thought I'd share some of the antique quilts that were on display from the private collection of Sharon Waddell. I'll show just a few today, and more next time. Honestly, there were so many spectacular quilts at the festival that it's difficult to only share the antique quilts, but in the interest of textile enthusiasts everywhere, since our love of antique quilts unites us, they're the ones I'm showing. Before I get to the antique quilts, I feel compelled to share one very special quilt made by Trista Dufresne. Trista fills a number of posts and serves on the VT Quilt Festival's Board of Directors. This busy woman gives her all to the show! This is the first quilt she's entered into a juried exhibit, and not only was it accepted, she won a Third Place ribbon! To stand before her quilt is to be assaulted (in the best way) by a very bright, bold "highlighter" yellow! Her handling of the colors, shapes and texture were a treat to see. To know Trista is to know this young woman can accomplish anything she sets her mind to. Congratulations, Trista! In honor of Independence Day, sharing this red, white and blue quilt seemed appropriate. This is entirely hand pieced and hand quilted. I love the overall energy achieved by each and every triangle. Collectively, they practically vibrate. To get up close and observe tiny hand made stitches was a joy. I'm not sure my eyes and hands would be up for the challenge of so many small narrow triangles. This quilt stopped me in my tracks. I may have even gasped. My photos don't do it justice, but it has to be seen by as many people as possible. What makes it so special, in my humble opinion, are the fairly fussy cut star blades from a delicate blue dot fabric. If you look closely, those blue dots look as if a paint-laden brush had been barely touched to the fabric. Blue bleeds out from the circle, like ikat, only it's not. Oh, and the hand quilting. The textures created are exceptional, and it took all of my self control not to reach out and run my hands all over this quilt! You can just feel the texture, can't you?! Detail, Snowflake Star. My new Half Pints will be on sale in the shop! 2.5" x 5" strips, 12 to a pack in a variety of colors. Convenient for 2.5" squares, HSTs, EPP, and much more! Unique pieces I've sewn also featuring fabrics printed by friends! Silk Noil, Eco-Bundled with rose leaves from my garden. This is one of many that will be in my shop on Saturday! Putting the indulgent organic hemp, screen printed fabrics by Sara Parker Textiles to good use...for you! Adding my own touch to vintage barkcloth, linen, printed fabrics by friends like Sara Parker and Karen Lewis! Don't we all need a bit of stitching whimsy? Fabrics and patterns will be on sale, and the shop will be stocked with lovely new products. I'm having so much fun making these goodies for you. I'm excited to get them into your hands! Last weekend, my daughter Alyssa and I enjoyed a visit to the Albright-Knox Museum in Buffalo. We saw the Shark Girl Exhibit and wow, was it impressive! Casey Riordan Millard's work includes dioramas, like the one shown here, delicate watercolor and guache paintings, wallpaper, porcelain sculptures and illustrations. She has also published a children's book about the adventures of Shark Girl. Visit #albrightknox or see the work in person. It's worth the trip! So you don't have a day to spend at a museum? How about an online tour of the International Quilt Study Center & Museum's exhibit: Sacred Scraps: Quilt and Patchwork Traditions of Central Asia. 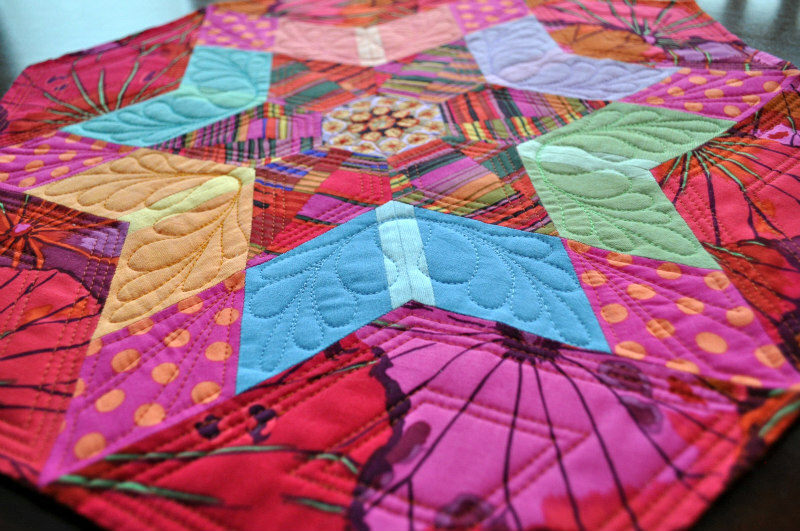 It's a colorful, dynamic body of work sure to peak any quilter's imagination! Today's post is brief. Following my heart, I'm embarking on a new body of work that has been percolating for some time. This new work connects my love of painting and textiles. As I share my process and results over the next few months, please stay tuned. I'd love your feedback. Just a small snapshot of my garden in June, my favorite time of year. Buzz Buzz Buzz is one of my favorite childhood books, written by Byron Barton, and appropriately speaks of my tendency to stay as busy as a bee. Most recently, I've been busy at the indigo vat. I've just listed some beautiful indigo offerings in the shop. Whether you're sewing a special garment or quilt, sprucing up your home, or knitting up a gift for someone you love, my goal is to provide the best quality hand dyed materials for your enjoyment. Indigo is my favorite of all natural dyes. In fact, as I'm typing this post, my fingers are tipped in blue. In addition to Indigo's intriguing history, I enjoy the slow preparation of the vat, the slow preparation of the fabrics and the slow process of dipping and waiting, dipping and waiting, dipping and - yes, you understand. Waiting. It's in the waiting that ideas become reality. A symphony of blues hang on the line. Each piece of cloth is unique, and has its own potential. If you haven't tried stitching or knitting indigo, treat yourself! You're worth it. Indigo is worth it. Check out these cheerful screen printed FQ's directly from the hugely talented, witty and warm, Karen Lewis! You may already know Karen's Blueberry Park collection for Robert Kaufman, as well as her dreamy retreat center, The Thread House. Karen and I recently did a fabric swap. I sent her natural hand-dyed organic poplins and she sent me her fabulous screen prints on Kona cottons. Karen's color genius currently sits on my work table, beckoning me to put it to good use. On Instagram, I've seen Karen's fabrics effectively paired with Liberty fabrics, and I've seen the magic Karen swiftly worked pairing her fabrics with mine, which can be seen on her Instagram feed. Too many ideas swimming in my head! Stay tuned. It can only be good! Welcome to my shop where you can purchase my hand screen printed fabrics, sign up to my bi-monthly fabric club, purchase my book, Screen printing at Home or come take a class with me! I am based on the edge of Leeds, Yorkshire, where I spend my days printing, quilting and designing new fabric collections for Robert Kaufman. I love travelling and go all over the world teaching printing and quilting so please do ask if you would like me to come over your way! When I am not working I am usually rambling around our local countryside with our scrumptious puppy Scout and any of my 3 (almost) grown up children and hubby. Enjoy perusing my shop and thanks for visiting! If you don't see what you want just drop me a line and ask as I take commissions in both fabric printing and quilting. Follow Karen on Instagram and Facebook - her feed will boost your mood in a heartbeat! Follow her Instagram Thread House feed. Inspiring! Remember to download my FREE Striped Octagon EPP template located in the right side bar, and dive in to some excellent summertime hand work. Also, download my FREE Gingham For Giants quilt pattern (crib, throw, queen) and stitch up a quick baby gift or new bed quilt. It's charm friendly and fast! Stitch something you love! I'm working on some new offerings for the shop, including finished quilts for sale, and some exciting new pre-cut bundles. Busy as a bee. Until next time, happy stitching! Gingham for Giants, my new FREE pattern! Click this photo to access the PDF. National Quilting Day and a Free Pattern! To celebrate National Quilting Day I'm releasing my newest FREE pattern, Gingham for Giants! To download your free PDF, simply click on the picture of this quilt located in the right margin, or on the photo above. National Quilting Day is celebrated annually on the third Saturday in March. This day came about in June of 1991, when a resolution was passed at the National Quilting Association's 22nd annual show in Lincoln, Nebraska. This is a day to appreciate and celebrate quilt makers and all that goes in to making a quilt, possibly making it my favorite day of the year! Use #NationalQuiltingDay to share your handmade quilts on social media. While local quilt shops, quilt museums and guilds will have their own ways to celebrate this special day, I'm sharing my quilt pattern, Gingham for Giants, for free with hopes of reaching new quilters, as well as seasoned quilt veterans. Charm friendly, the quilt comes together so quickly, resulting in a smart looking, snuggle-worthy addition to your nearest couch or bed! Complete instructions are provided for three sizes: crib, throw/twin, and queen. If you have baby gifts to make, this modern take on a traditional design will look fantastic in any nursery. Think of the colors you could use! This design goes a long way in that it's universal appeal is perfect for toddlers, teens and adults alike. I've made more than a few of these and I'm always excited to see how the colors I've chosen come together! Please share your Gingham for Giants quilt(s) on social media: #ginghamforgiants. I'd be thrilled to see your colors and your quilts! For those of you interested in natural dyes, I've created the gradients in the two quilts shown here by dyeing the first vat, and then proceeding with two more exhaust vats. While I no longer dye with Logwood (purple) because of its toxicity, I always feel great satisfaction from the variety of warm pinks obtained with Quebracho Rojo. If you're interested in trying your hand at natural dyes, please contact me for a custom dye kit (colors and pricing.) I'd be happy to put one together just for you! These quilts were made using my 100% organic cotton sateen. Because of their silky softness, touching these quilts really is a pleasure. Yardage is available in my shop here. As you can see, when it comes to quilting this design, it lends itself well to straightforward stitching in the ditch, but it also shows off free-motion feathers, spirals and circles! HAVE FUN!